What began as the simple desire to preserve a 200-year old farm house on eight rural acres adjacent to Halcyon Farm, ended up with not only the acquisition of the property, but the full historic restoration of the old farm house. Then the question of how best to use the house and land was upon the two owners. It was not long before the concept of Halcyon House Antiques was born. The idea was to create a retail space mixing antiques, fine art, one-of-a-kind furniture and decorative accessories in actual room settings. 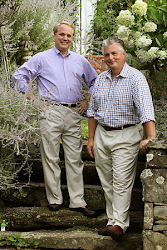 So in 2008, Stiles T. Colwill and Jonathan Gargiulo opened Halcyon House Antiques. Using Stiles' decorating talent and Jonathan's buying and merchandizing skills, Halcyon House Antiques quickly has become an extension of their lifestyle – casual living comfort, a love of entertaining and a celebration of friends. Located fifteen minutes from downtown Baltimore, and nestled in the beautiful Greenspring Valley, Halcyon House Antiques is a must visit destination.